Our Nation's warfighters earn our respect and appreciation every day. At HJF, we advance military medicine to support and protect these brave individuals, past, present and future. Donate now to join our mission! We help veterans and combat-wounded, ill and injured Army, Navy, Air Force, Marine Corps and Special Forces warriors and their families access advanced medical care from groundbreaking military medical research and education. Some veterans make the adjustment to civilian life with ease, while others face challenges. The Veterans Metrics Initiative: Linking Program Components to Post-Military Well-Being (TVMI Study), led by HJF, follows 9,566 recently separated veterans, including National Guard and Reserve, over the first 3 years of their transition from military to civilian life. Participants take surveys every 6 months, answering questions about their work, relationships, health and finances to give a holistic picture of their overall well-being and how it changes over time during this period. One goal of the TVMI Study is to identify program components veterans used during their transition to civilian life that result in the highest well-being outcomes. Whether those components offer services such as resume editing or substance abuse counseling, this study helps identify the correlation between program components veterans are using and their well-being. A veteran who works with one of the study partners summed it up: "We tend to study the problems for veterans and don't have a good sense of the entirety of the population, where they land and how they do. Just knowing that is really ground-breaking." Imagine separating from the military and adjusting to a new life on your own, without knowing what types of support really can help achieve your goals. With the TVMI Study results, you can focus on what works to make the transition to your new civilian life as smooth as possible. 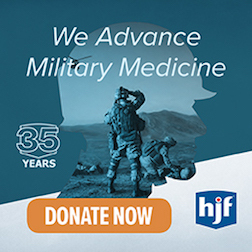 TVMI is just one example of research supported by your donation to HJF that works around the world to advance military medicine for our Nation's war-fighters.